Jazz up your GM with Bodyside graphics. Made of high-quality materials and available in an assortment of colors and styles. 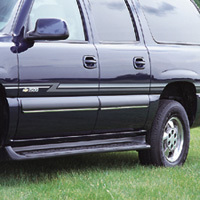 GM Accessories has a deign to complement your vehicles body color. Both stripe packages include a hood stripe and Bodyside stripe. The double stripe package also includes a rear stripe.